Since the establishment of the Republic of Panama in 1904, the banking sector has played an important part in the country’s commercial activities and economic growth. The International Bank Corporation (now Citigroup) and the National Bank were the first to establish banking operations in Panama in 1904. Panama’s strategic geographic position, the free circulation of the US dollar, the country’s political, economic and legal stability, quality of life and modern banking legislation and regulations, are key elements in attracting international banks to Panama. Among those that have established a branch or subsidiary in Panama are Scotiabank, Bank of China Limited, Lafise Bank, GNB Sudameris Bank, PKB Banca Privada (Panamá) SA, Bancolombia, Banesco, Banco del Pacifico (Panama), SA, BAC International Bank and Banistmo, SA. Additionally, JPMorgan Chase & Co, Bank Julius Baer & Co Ltd, UBS Switzerland AG, UBS AG and Safra National Bank of New York, inter alia, have obtained a licence to establish a representation office in Panama. In previous years, other international banks have obtained a banking representation licence before obtaining a banking general licence or a banking international licence. General licence: authorises a bank to engage in banking business in or from Panama, and to carry out whatever other activities the Superintendency of Banks (Superintendency) authorises. International licence: authorises a bank to engage in, from an office established in Panama, transactions that are perfected, consummated or have an effect outside Panama, and to carry out any other activity that the Superintendency authorises. Representation licence: authorises licensed foreign banks to establish a representation office in Panama and carry out any activities that the Superintendency authorises. Representation offices must always include the expression ‘representative office’ in all their operations. Latin-America Foreign Trade Bank, SA (best known by the Spanish acronym of Bladex) (Multinational): US$6,198,928,954.183. Decree Law 9 of 26 February 2009, amended by Decree Law 2 of 22 August 2008 (Banking Law), created the new banking regime and established the Superintendency. Pursuant to the Banking Law, only banks authorised by the Superintendency can carry out banking business in or from Panama. ‘Banking business’ means, principally, taking resources from financial institutions or the public, or through the acceptance of deposited money, or by any other means that the Superintendency or the banking practices have established, and using those resources at the bank’s risk to grant loans or make investments, or any other operation defined by the Superintendency for these purposes. The Superintendency is the agency in charge of supervising banks established in Panama and banking economic groups. Banks established in Panama must be incorporated as a corporation or as a limited liability company. Additionally, foreign banks that wish to operate in Panama must establish a subsidiary or a branch before applying for a banking licence. All banks established in Panama must have a physical presence. Overseas banks not having a branch in Panama require a banking representation licence to promote their banking business in Panama without engaging in any banking activity in the country. Consequently, all banking activity (e.g., deposit-taking, loans, investment) must be undertaken outside Panama. The Superintendency must safeguard the soundness and efficiency of the banking system through regular off-site or on-site examinations of banks at least once every two years, or as ordered by the board of directors of the Superintendency or when the Superintendency deems it necessary. Macroprudential supervision: the Superintendency carries out macroprudential supervision to mitigate systemic risks that may threaten financial stability and to guarantee the soundness of the financial system. Microprudential supervision: the Superintendency carries out microprudential supervision through on-site and off-site inspections of banks to examine the soundness of each banking institution and banking group, and examine their financial conditions and compliance with the banking legislation and regulations, and anti-money laundering and counter-terrorism financing legislation. The Superintendency has prepared a guide for microprudential supervision called the Uniform Risk-Based Supervision Manual. compliance with anti-money laundering and counter-terrorism financing regulations. At least seven natural persons with the relevant knowledge or experience regarding the operations and the risks inherent to the banking activities must form the board of directors of a bank. The majority of the board members must be persons who do not participate in the daily administrative management of the bank, or whose director condition does not present any business, professional, ethical or material conflict of interest. The chief executive officer, the operational manager, the chief financial officer or their equivalents cannot preside over the board of directors. At least two members of the board must be independent directors. develop processes that identify, measure, verify and control the risks that the bank has engaged in. Senior management includes general management, the executive vice president, the executive president or other equivalent titles. The second-ranked executive level includes deputy general managers or any other equivalent name, and other managers and executives who carry out key functions and must report directly to their superiors. There is no distinction between a bank that is a subsidiary and one that is not. However, banks that are branches of a foreign bank and banks with an international banking licence for which the Superintendency is the host supervisor can evidence compliance with Rule 005-2011 by issuing an annual certification from their head office or their responsible regional office, that the bank has the structure, organisation and controls in place to guarantee good corporate governance in accordance with sound banking practices. There are no restrictions on bonus payments to managers and employees of banking groups, or limitations on the amount of remuneration bank group employees can receive. Pursuant to the Banking Law, banks with a general banking licence must have a minimum capital of US$10 million, and banks with an international banking licence must have a minimum capital of US$3 million. A bank’s total capital is made up of primary, secondary and tertiary capital. Primary capital is made up of paid social capital, declared reserves and retained earnings; secondary capital is composed of non-declared reserves, revaluation reserves, reserves generated for losses, hybrid debt-capital instruments and subordinated term debt; and tertiary capital is exclusively composed of short-term subordinated risk to address market risk. The Banking Law establishes that all banks with a general or international banking licence must have a capital adequacy of at least 8 per cent risk weighted on the bank’s total assets and off-balance sheet operations. Notwithstanding the above, banks have an average risk weighted capital adequacy of the Banks Index that is much higher than the 8 per cent required. The Superintendency will have a regulatory capital concern when transactions that could reduce the bank’s capital are below what the law requires. In this respect, a few years ago, the Superintendency had to order the compulsory liquidation of a bank that lost a lot of capital funds by investing in high-tech securities. Notwithstanding the above, the Superintendency has issued the following rules to implement Basel III: Rule 1-2015 of 3 February 2015, establishing rules that govern the capital adequacy of banks and banking groups; and Rule 3-2016 of 22 March 2016, amended by Rule 8-2016 of 29 November 2016, establishing rules that determine the credit risk and counterparty risk-weighted assets. The Superintendency has the legal authority to carry out the consolidated supervision of the banking group of which the banks are members. This supervision is carried out by on-site and off-site examinations. For the Superintendency to supervise banks and banking groups outside Panama, the Superintendency must sign a memorandum of understanding with the banking regulator of the country of origin. On liquidity regulations, pursuant to the Banking Law, banks with a general or international banking licence for which the Superintendency is the supervisor of origin must maintain at all times minimum liquid assets of 30 per cent of their total deposits. Notwithstanding the above, the average liquidity index for banks established in Panama during 2016 was between 57.26 and 63.57 per cent, which was much higher than the legal amount required. if the Superintendency confirms that the bank’s capital adequacy, solvency or liquidity has impaired its operations and requires the involvement of the Superintendency. The Superintendency may order the reorganisation of a bank, requesting it to take certain measures and adopt the changes necessary to protect the interests of the bank’s depositors and creditors. The Superintendency also has the authority to order the compulsory liquidation of a bank over which it has previously taken administrative and operative control. There is no possibility of winding up a bank that has failed (or is considered by the relevant regulator to be reasonably likely to fail) in an orderly manner while preserving its critical functions (e.g., deposit-taking and payment services) and minimising the need for any taxpayer ‘bailout’ and serious market disruption. ‘Bail in’ powers do not exist either; that is to say, the powers of a regulator or government authority to require the mandatory write-down or conversion to equity, or both, of the debt upon the occurrence of certain triggers associated with a bank’s failure or reasonable expectations of a bank’s failure, whatever the terms of the debt. 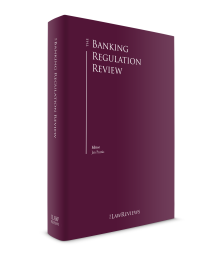 Rule 005-2011 of 20 September 2011, whereby good corporate governance provisions applicable to banks are updated, governs banks’ conduct of business. Banks must also comply with the Banking Law, anti-money laundering and counter-terrorism financing laws and other applicable laws in conducting their business. a private reprimand, a public reprimand or a fine of up to US$50,000 for a violation of the Banking Law that does not have a specific sanction. The Superintendency may levy the sanctions imposed on the bank on its directors, officers, managers, employees and any other personnel involved in the violation of the provisions of the Banking Law. In the case of employees and directors, the bank will be jointly and severally liable for the fines imposed on its personnel. The fines and sanctions imposed by the Superintendency are without prejudice to any criminal and civil liability against the bank, its directors, officers or employees by any applicable law. when the information is provided to date processing agencies or offices for accounting and operative purposes. Banks typically fund their activities with capital that the bank assigns for operations, the deposits taken from their customers, and loans obtained from other banks. There is no central bank in Panama. The Superintendency supervises the persons controlling or otherwise having a significant stake in banks, and any change to the controlling persons of a bank requires prior authorisation by the Superintendency. Pursuant to Rule 001-2004 of 29 December 2004 issued by the Superintendency, transfers of shares of banks or of economic groups of which banks are a member, or any modification in the shareholder composition of a bank, requires prior authorisation from the Superintendency, provided that the transfer involves a change of control or there exists a concerted action causing a change in control, or there is a significant interference. There is a change of control when the acquisition or transfer of the capital stocks of a bank, or an economic group of which the bank is a member, whereby the buyer or any other natural or juridical person acting individually or in concerted action, becomes the whole or majority owner, or obtains control directly or indirectly of the bank’s administration. There is a significant interference when the transfer of the stock capital of a bank, or an economic group of which the bank is a member, involves 25 per cent or more of the stock capital. There is a concerted action when natural or juridical persons act in concert to achieve a common goal to acquire control of a bank independently, whether or not there is an agreement between the parties. It can also mean combined and other interest votes for a common goal by a contract, understanding, relation or agreement in writing or otherwise. A detailed business plan containing the preliminary plans that the proposed buyer intends to develop once the Superintendency authorises the transfer of stock shares must be filed with the application for regulatory approval of an acquisition stake in a bank. However, this is not the case for a significant stake in a holding company of a bank. Stock purchase agreement of the capital stocks of the bank: the buyer buys all or the majority of the issued capital stocks of the bank representing a change of control. This is the most common type of bank merger or acquisition transaction. In many cases, a local bank will buy the stocks capital of another local bank, and later merge with the subsidiary bank. Balboa Bank & Trust Bank merged with Transatlantic Bank, SA in 2011 using this structure. Merger by absorption: the surviving entity will absorb all the assets and liabilities of the merged entity. Merger by absorption is the second most common type of bank merger or acquisition transaction. Merger by consolidation: both entities will disappear, and a new integrated entity will emerge. Merger by consolidation is the third most common type of bank merger or acquisition transaction. Public stock offering: an entity makes a public offering for the traded shares of a bank. Although small in number, the cases of public stock offerings have been an important element in the composition of the International Banking Centre. These cases are the acquisition by a public stock offering of National First Group, SA by the Isthmus Bank, SA (2000), Wall Street Securities by Continental Bank, SA (2004), Banistmo Group, SA by HSBC Asia Holdings BV (2006) and Banaagricola, SA by Bancolobia (Panama), SA (2007). The transfer of deposits from one bank to another requires the prior consent of the client. Loan arrangements can be transferred by the bank without the prior consent of the client, unless the parties have established in the arrangement that the client must give his or her consent. Through Law 5 of 21 February 2017, the National Assembly of Panama approved the Convention on Mutual Administrative Assistance in Tax Matters, enacted in Strasbourg on 25 January 1988, amended by the amending Protocol of Paris executed in Paris on 27 May 2010. With the enactment of this Convention, Panama can automatically exchange financial information on tax matters with more than 100 member countries of the Convention. Through Resolution SBP-0057 of 7 April 2017, the Superintendency ordered the compulsory liquidation of FPB Bank Inc. Through Law 21 of 10 May 2017, the National Assembly established rules for the regulation and supervision of trustees and trust business. Through Executive Decree 124 of 12 May 2017, the Panamanian government established procedures for the reporting of information by financial institutions under the Foreign Account Tax Compliance Act (FATCA) in light of an agreement enacted between the Republic of Panama and the United States to comply with FATCA, and establishes the procedures for the automatic reporting by financial institutions of financial information for tax purposes under the Common Reporting Standard promoted by the Global Forum on Transparency and Exchange of Information for Tax Purposes. In this respect, all reporting under FATCA and the Common Reporting Standard must be done thorough the Directorate of General Revenues (Panama’s tax authority). Through Resolution SBP-0090 of 30 May 2017, the Superintendency cancelled the representation licence of Credit Suisse AG. Through Resolution SBP-0148 of 9 August 2017, the Superintendency authorised the merger by absorption of Canal Bank and Universal Reforestation of Chiriqui Corporation (Reforestadora Universal de Chiriqui Joint-Stock Company), resulting in Canal Bank, SA as the surviving entity. Through Resolution SBP-0184 of 6 October 2017, the Superintendency authorised the transfer of 100 per cent of the issued shares of Balboa Bank & Trust, and its subsidiaries, in favour of BCT Corporation, producing a change in the direct control of Balboa Bank & Trust, and the indirect control of its subsidiaries. Through Resolution SBP-0235 of 14 December 2017, the Superintendency authorised the acquisition of 50 per cent of MMG Capital Holdings, which owned 100 per cent of the issued shares in MMG Bank Corporation. Through Resolution SBP-0243 of 29 December 2017, the Superintendency authorised the merger by absorption of BAC International Bank Inc and BAC Leasing Inc, resulting in BAC International Bank Inc as the surviving entity. Through Resolution SBP-0244 of 29 December 2017, the Superintendency authorised the merger by absorption of BAC International Bank Inc and Credomatic of Panama, joint-stock company, resulting in BAC International Bank Inc as the surviving entity. Panama’s Attorney General and the Superintendency investigated a number of banks for their presumed involvement in Odebrecht and other local and international corruption scandals. Law 21 of 2017 granted the Superintendency more tools for the supervision and regulations of banks that act as trustees, and over the trust business. Many banks or banks’ subsidiaries have a licence to act as a trustee in or from Panama. Additionally, the Superintendency now has the power to regulate the trust business. In June 2017, Panama was removed from the black list of the Global Forum on Transparency and Exchange of Information for Tax Purposes of the Organisation for Economic Co-operation and Development (OECD). In this evaluation, Panama obtained the second highest grade possible in compliance with the tax transparency principles of the OECD. In August 2017, banks made their first report under FATCA and the Common Report Standard. In December 2017, the European Union included Panama on a black list of countries that do not make enough efforts in the fight against tax evasion. However, Panama was removed from that list in January 2018. Panama continues working with the OECD and the European Union to comply with international principles on tax transparency. It is highly likely that Panama’s banking sector, economy and foreign direct investment could be affected if the OECD or the European Union includes Panama on a black list of tax havens, as foreign banks that are already established in Panama may decide to abandon the market and others may decide not to set up operations in Panama. It is also highly likely that more banks will merge or have a change of control during 2018. Based on the foregoing, the Superintendency is working on a marketing programme to promote the establishment of foreign banks as Panama has increasingly become a centre for international banking in the past few years, as well as an important regional banking centre. To conclude, the Panama International Banking Center is one of the major pillars of the Panamanian economy. The government and the Superintendency must continue to strengthen laws on tax transparency, anti-money laundering and the financing of terrorism and weapons of mass destruction to maintain a sound and efficient banking system. Some of the features of the banking centre are that it offers ideal conditions for all types of modern banking transactions, local banks have an important role in international transactions, and advanced telecommunications allow major banking transactions 24 hours a day. Thus, the banking centre will continue to be a major factor in the Panamanian economy. 1 Mario Adolfo Rognoni is an associate at Arosemena Noriega & Contreras.